Hi, this is my first post on this blog. I am a SAHM of two kids and love to knit and crochet. My latest finished project was this bag. 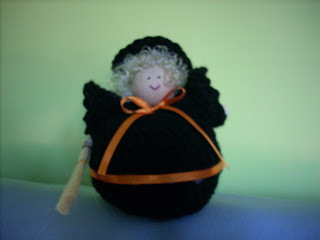 more pictures and other projects are on my blog. 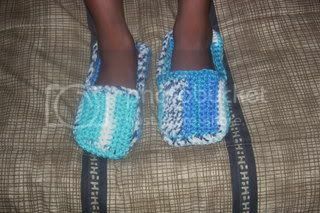 Ok here go some house shoes I whipped up for my girls. I was practicing to see how it turns out while doing the first shoe. My girls was ohhhh and awwwwing so I decided to go ahead and finished them up and here they go. 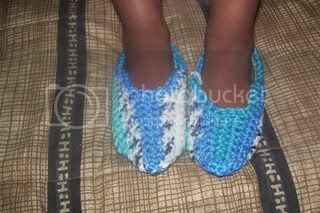 Here go Nellie with her pointed toe house shoes. Reminds me of elfs shoes lol. 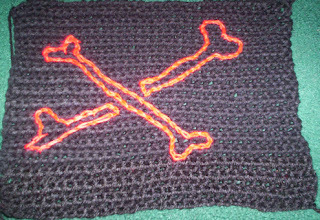 Again no pattern one day I will have to sit and write a pattern as I crochet it's just that I am so used to making up as I go. :) So what do you all think?????? im not doing alot i posted alot to my blog but will only one picture here. I just checked and my heart is still beating!!! 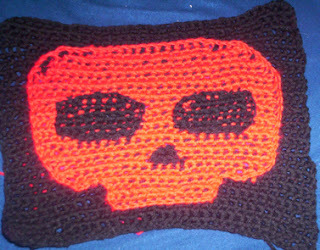 :) But I haven't been doing a lot of crochet these days. I'm stuck on the spidey afghan! I don't understand how I'm suppose to make the webbing?! 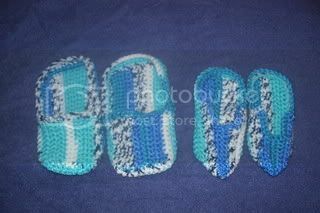 When I read the pattern it says that I'm suppose to crochet backward! I really don't know how to do that. I will try something else, don't know yet, if any of you "chicks" know a simple way to make the webbing please let me know. On another subject, I did a bit of sewing, if for a swap on craftster, you can see it on my blog just click on my name above :) It's a simple and fun mini tote. I just love making it, and may start making more to sell on the web. I made one for my sister with an old Charlie Brown bed sheet and an old curtain...I don't like to waste material. I'm one of those people who "REUSE, REDUCE, RECYCLE". Imagine we (the world) use to throw old curtains, bed sheets, etc. in the garbage!!! Now I think twice before throwing anything away. If I don't reuse it I give it to good will! I have a few t-shirt my teenage step-daughter gave me to recon for my wee daughter, I'm just waiting for inspiration or a simple easy way to recon them..any suggestions?? OK, that's it for me (for now :O)). How are the rest of you "chicks" doing?